With over 29,000 Members, over 230 Corporate Members, and over 115 Chapters, the International Institute of Business Analysis™ (IIBA®) is the recognized, non-profit association for business analysis professionals around the world. 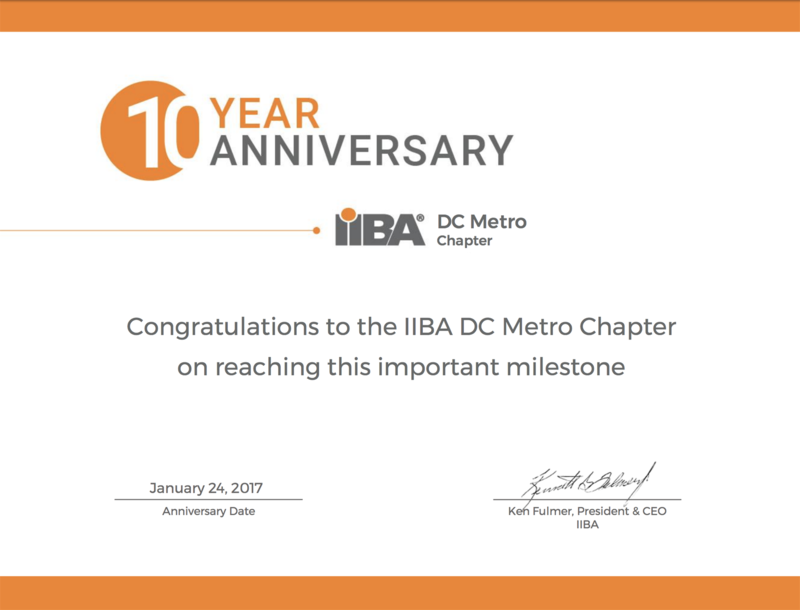 Our local IIBA DC Chapter welcomes members from around the DC metro area to share our talents and experience, assist with achieving IIBA certification, and increase our community's knowledge, networks and connections. The IIBA DC Chapter is launching a CBAP® study group for members interested in pursuing the IIBA CBAP® certification. This is an intensive, long-term study group that aims to provide a structured, collaborative environment for serious, committed CBAP® exam preparation and study. This group would also be appropriate for anyone seeking the CCBA® certification. Look out for our updates on social media!